Authors: Bharath RG, Shivanand S, Karthik S.
Assistant professor, Department of Orthopaedics, Kempegowda Institute of Medical Sciences. India. Dr Bharath Raju G: 607, ‘b’ Wing, Building No. 3, Neelam Nagar, V.B. Phadke Road, Mulund (east), Mumbai- 400081. E-mail: drbharath77@yahoo.com. Introduction: Epithelioid hemangioendothelioma (EHE) of the bone is extremely rare and occurs predominantly in males. It most frequently occurs during the second and third decades of life. The lower extremities are most commonly involved. We describe a diagnostically challenging case of epithelioid hemangioendothelioma of proximal phalanx of 2nd toe of left foot with histological features reminiscent of osteoblastomatosis. 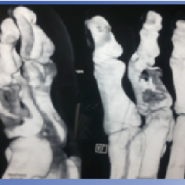 Case Report: A 52 year old man presented with history of intermittent pain with swelling in second toe since 6 months. Radiograph showed a lytic lesion in proximal phalanx of the great toe. CT and MRI reported non specific lesion in the toe. Pain was quite severe and as the patient was a labourer and wanted to get back to his work as soon as possible a decision of disarticulation of the second toe at metatarsophalnageal joint was taken. Histopathology confirmed the diagnosis of Epithelioid hemangioendothelioma and patient was called for regular follow up. There are no complications and recurrence at two year follow up. 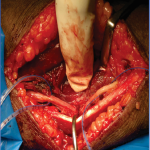 Conclusion: EHE of the bone is extremely rare vascular tumor. To our knowledge, this is the first case of EHE with such features. EHE should be kept as one of the important differential diagnosis while diagnosing vascular tumors. Careful attention to the histopathological features is necessary for the confirmation of the diagnosis. Keywords: Epitheloid haemangioma; epitheloid haemangioendothelioma; rare occurrence; vascular tumor. July 1, 2013 Research! Research! Research! What are Thou?